When you picture Las Vegas, there’s no doubt the Vegas Strip is the first place that comes to mind. The Strip is the four mile stretch of Las Vegas Boulevard where the most popular hotels and casinos in the city are located, and where the vast majority of tourists spend their time. Walking down the Strip for the first time is such a unique experience! Neon lights surround you, there are street performers every few feet, it’s packed with people and excitement—it’s basically like Times Square on steroids! There is a ridiculous amount going on and it’s so much bigger than you would expect that you could stay on the Strip for a couple weeks and still not see everything! 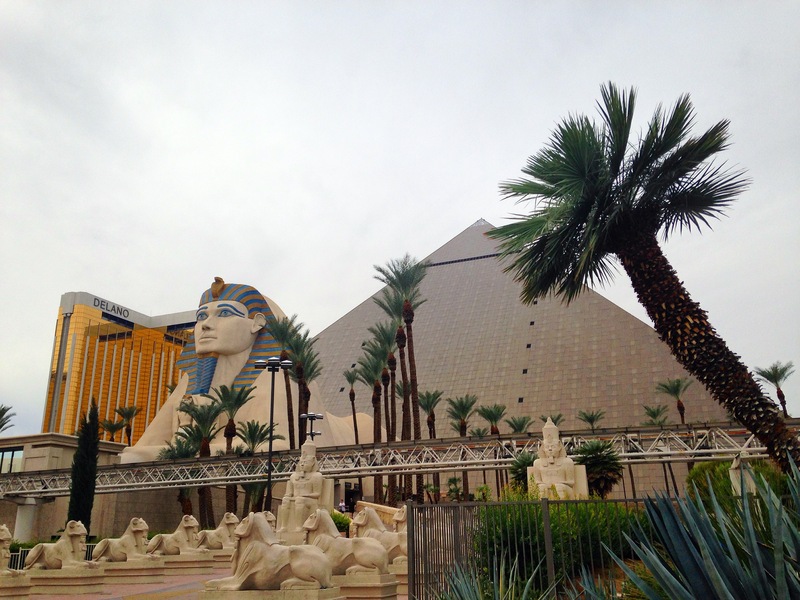 Of course walking the Strip past all the hotels and casinos is really exciting, but another great way to spend your time is by going into and exploring the different places that you pass. Each hotel/casino on the Strip has a unique theme and is full of elaborate design features and activities. On my recent visit to Las Vegas, I spent a lot of my time exploring the hotels on the Strip, and was able to experience almost all of them! After long days I would also enjoy watching TV in my hotel room. Thankfully, each hotel offered good cable thanks to the Hotel TV Installer that they had partnered with. After my experience in Las Vegas, I present to you my list of the must-see hotels/casinos on the Strip and what unique features you can find at each one. My favourites are at the top of the list! If I had to pick one hotel that I loved more than any other, it has to be the Venetian. Outside the hotel, the architecture looks so grand, bridges cross over canals where gondolas are slowly moving through the water, and it really feels like you’re stepping out of Las Vegas and into Italy. Like all of the hotels, you’ll end up in the casino as soon as you walk through the entrance. But head past that and you’ll come across so many cool things. By far the coolest: the indoor canals that wind through most of the second floor. Lining the canals, the hallways are designed to look just like Venice with bridges crossing the canals and restaurant terraces and designer shops lining the walkways. Another awesome feature: a huge room designed to look just like St. Mark’s Square. The canal crosses into this room and throughout the day you can watch “street performers” in the square. The details in the Venetian are amazing, with authentic looking Italian houses and a ceiling designed to look like the Sistine Chapel. Also attached to the hotel is Madame Tussaud’s wax museum which has become really popular in New York and London. Throughout the museum, you can see and take pictures with your favourite celebrities who look extremely real! And something that is definitely worth the extra cost: the gondola rides. You can either choose to ride a gondola on the indoor canal or the outdoor canal, and while you ride, your gondolier sings to you in both English and Italian. 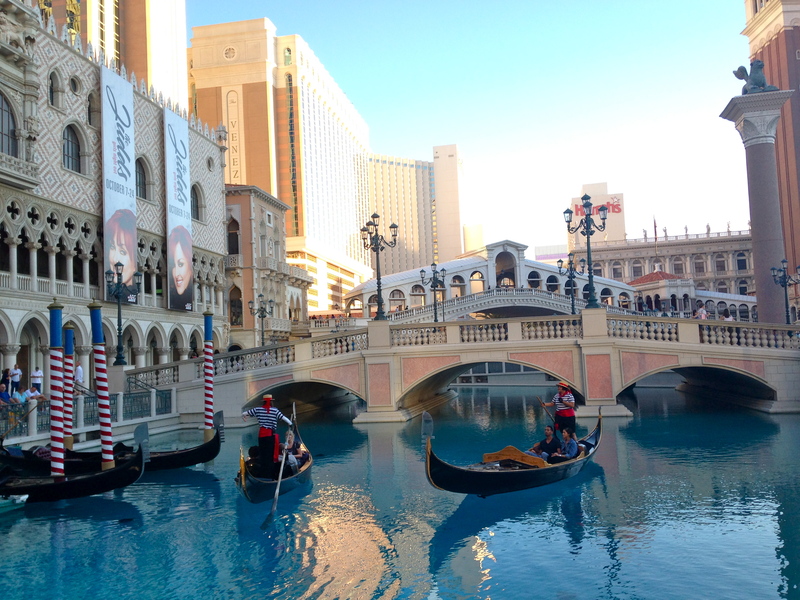 Normally, the gondola rides are $21 per person and can fit four people at a time, but if you are lucky you may come across a special promotion on the Strip somewhere. In exchange for my parents touring a new hotel, my family was able to receive a gondola ride, tickets to Madame Tussaud’s wax museum, and a romantic dinner for two in the Venetian for only about $50 total, so a pretty awesome deal! Another awesome hotel and the one my family was lucky enough to stay at—New York New York. As you can obviously tell from the name, this hotel and casino is based on New York City. From the outside, you can see smaller versions of all the most famous NYC landmarks: the skyscrapers including the Empire State Building and Chrysler Building, the Statue of Liberty, and the Brooklyn Bridge. Inside, once you pass through the casino it feels just like you are walking through the small and quaint streets of Greenwich Village, which include a New York-style pizza place, a New York-style deli, and New York-style bagels. They even have the famous Shake Shack! Upstairs, there are more places to eat and the best New York bar from a movie: Coyote Ugly. Just like in the movie, the bartenders dance on top of the bar while wearing outfits that are, let’s just say, very Vegas. At night the bar gets really crowded and you’ll have to pay a cover to get in, but if you go during happy hour between 6-9pm, you’ll be treated to some fun drinking games and free shots! My family visited on our last day before heading to the airport and took part in a game of flip cup. I only wish we had discovered how fun Coyote Ugly was sooner! And the most exciting feature of New York New York: the famous roller coaster that weaves through the skyscrapers of the hotel. The roller coaster looks like it would be pretty tame, but it goes really fast and has some sharp drops! I am a huge fan of roller coasters so I loved that, especially since my friend Ben and I got to sit in the front row! We chose to do the roller coaster at night—a good decision I think because it was so cool seeing the Strip and hotel all lit up, and it added to the overall thrill factor. The roller coaster normally costs $14 per person, but if you are staying at the hotel, tickets are buy one, get one free! 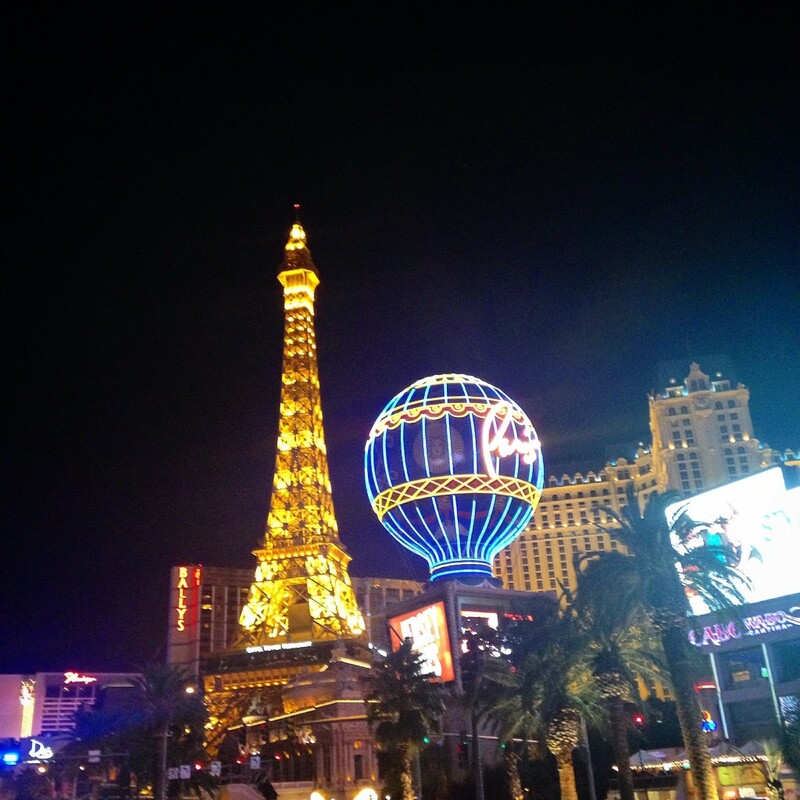 Even in Las Vegas, there is really nowhere quite like Paris. On the outside you can see the Eiffel Tower and the Arc de Triomph. If you walk the Strip at night, the Eiffel Tower is all lit up and is more noticeable than anything else on the skyline! Inside, the hotel and casino are designed to look just like the quaint little streets of Paris. 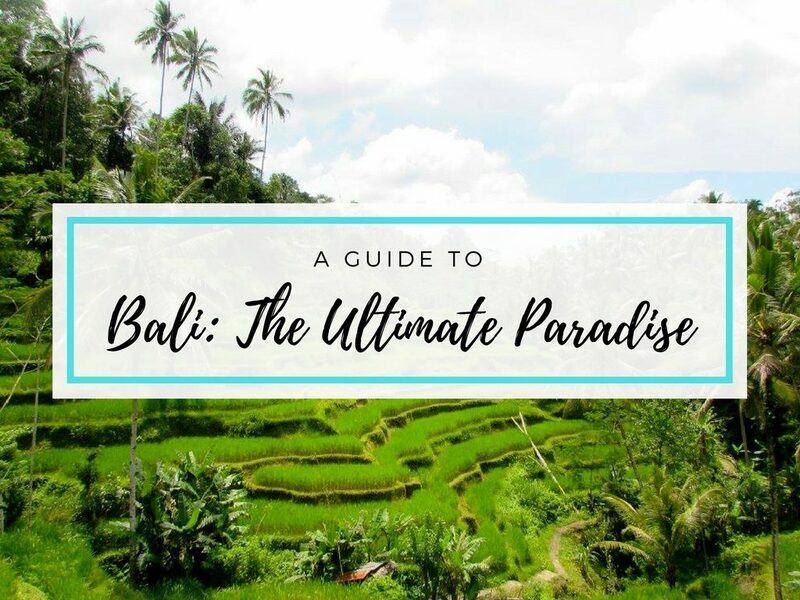 There are boutiques where you can shop, restaurants with terraced seating areas, and a really popular crêpe shop. The hotel is full of some of the best restaurants in Las Vegas including Gordon Ramsay’s fine dining Steak and popular French restaurant Mon Ami Gabi. It’s also where you’ll find some of the best nightlife such as Chateau rooftop nightclub which overlooks the Bellagio fountain and Le Cabaret where you can see live music while sipping on specialty cocktails. The most popular experience at the Paris hotel is definitely its view from on top of the Eiffel Tower. Half the size of the actual Eiffel Tower, the one in Vegas brings you 46 stories above the Strip where you can get amazing 360° views of the city. This spot is really popular for weddings and is super romantic, especially at night with the city lit up below. There is also a restaurant located on the 11th floor of the Eiffel Tower where you can get some delicious French cuisine. And a new attraction to check out: Hexx Chocolate & Confexxions where you can see the process of how chocolate is made and then taste some of the sweets… need I say more? 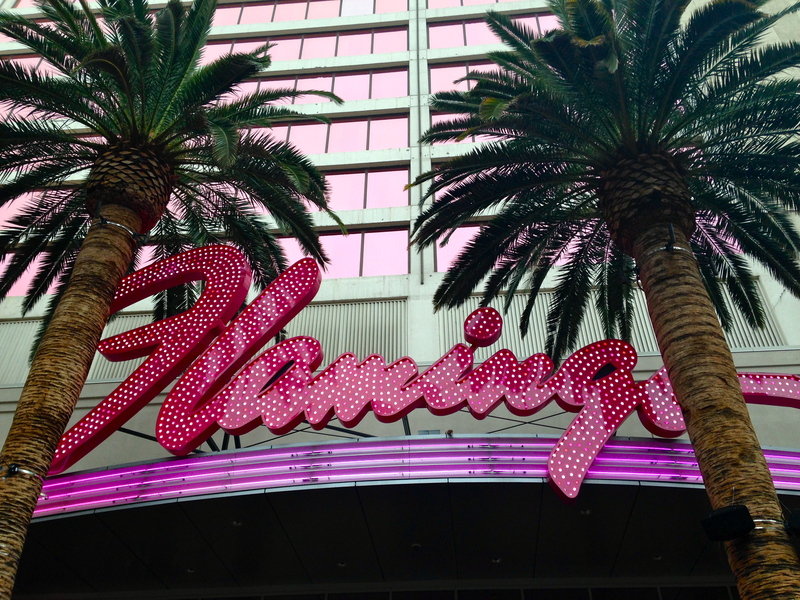 The Flamingo was the first luxury hotel on the Vegas Strip, so it definitely has a lot of cool history to it! The hotel and casino have a retro art deco style throughout and really took inspiration from Miami. The colours are bright and fun, and there is a big outdoor sanctuary that really does feel like you are right in southern Florida! 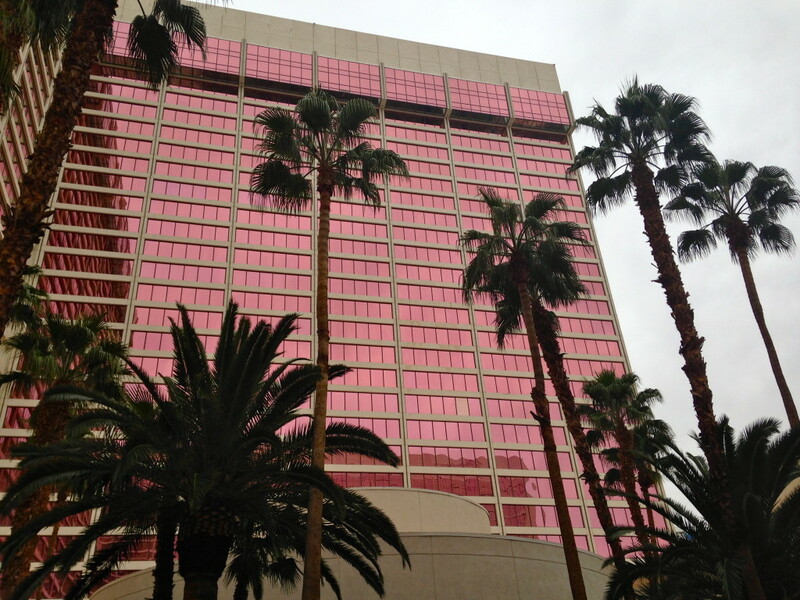 You’ll find some fun bars at the Flamingo, but their biggest draw is the Wildlife Habitat outside. It’s full of tropical birds that you can view and take pictures of, which naturally include some beautiful flamingos! Throughout the day, there are also some resident parrot trainers that set up right as you enter the outdoor area. You can hold the parrots and the trainers will take professional photos of you with the birds. Just holding the parrots is completely free, but of course if you want the photos they took of you, you’ll need to pay. Or you could always have someone take some sneaky photos, like I had my sister do while I held the parrots! It was a cool experience and the parrots were so cute. And they behaved themselves for the most part, except when one tried to eat my earring! Probably the most famous of all the hotels on the Strip, and also one of the most high-end places you can stay, is the Bellagio. Like some of the other hotels on the Strip, the Bellagio has an Italian theme, specifically Lake Como. The interior is beautiful and all seems very high end, including lots of designer shops. And a little tip: if you want a unique photo op of Paris, go into the Louis Vuitton store in the Bellagio. There is a balcony with an amazing view of the Eiffel Tower and the Bellagio fountains. You need to make a reservation if you want to actually go onto the balcony, but you can still get a nice view through the French door! 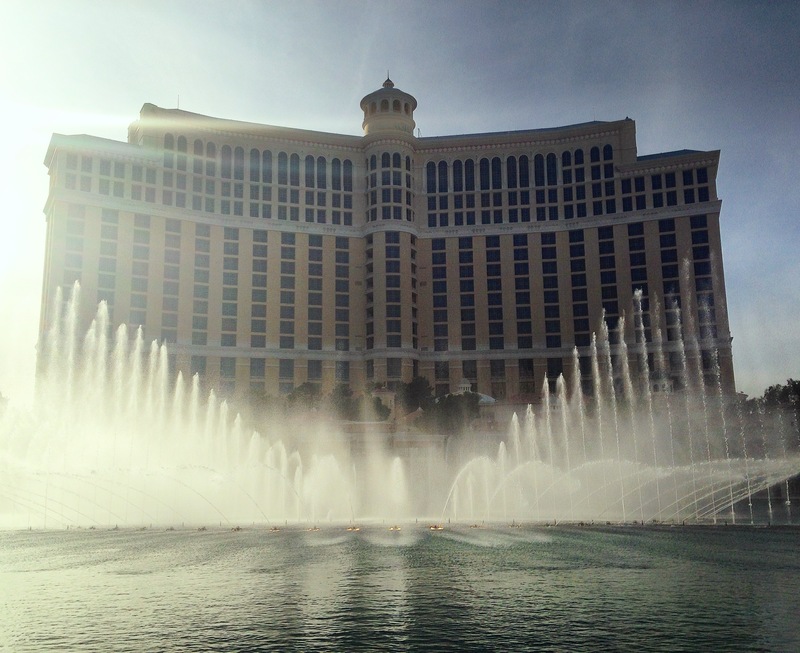 By far the most well-known and popular attraction at the Bellagio are the fountain shows that happen right outside. Throughout the day, shows happen every half hour and between 8pm and midnight, shows happen every fifteen minutes, so you have plenty of opportunities to catch the shows! For each show, a different song is played and the fountains shoot off water and dance along in tune with the song. I ended up seeing five fountain shows total, both during the day and at night, and I have to say the nighttime shows are definitely more magical. My favourite one was on the last night to the Frank Sinatra song Luck Be A Lady. Another great free attraction is the Conservatory. It’s full of plants that go along with a theme that they change up fairly often. During my visit, the theme was autumn. And if you are an art fan, the Bellagio is the place for you. They have a Gallery of Fine Art, which is currently showcasing Picasso and is supposed to be amazing! Similar to the Bellagio fountain shows, the Mirage also has an exciting show outside. 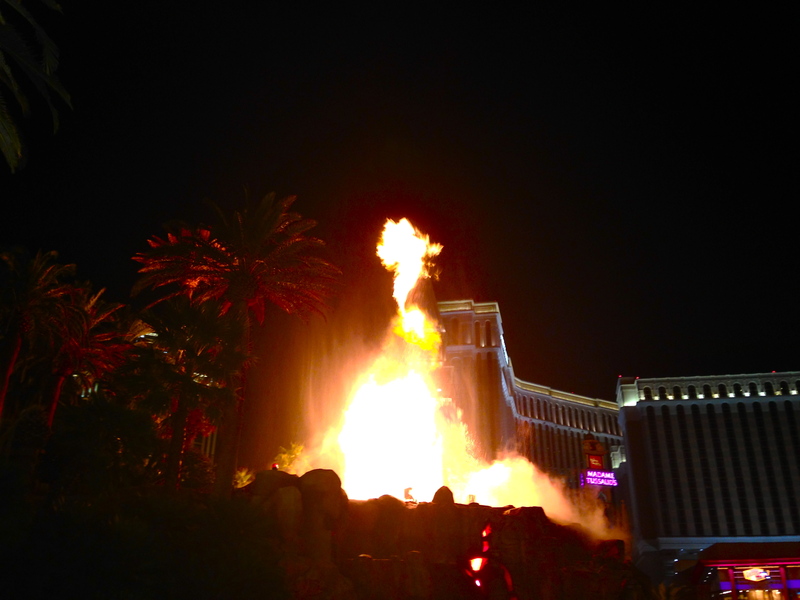 The hotel is based on a Hawaiian theme, so of course that wouldn’t be complete without a volcano! In front of the hotel, you can watch the volcano erupt in a really impressive show. Then, head into the hotel to see the beautiful atrium and a huge fish tank right behind the check-in desk. It’s really beautiful and might have been the only hotel I went into where the casino isn’t the first thing you see when you walk in! And by far the most spectacular attraction at the Mirage: the Secret Garden. In this Secret Garden, you can meet some beautiful tigers and tiger cubs as well as dolphins! 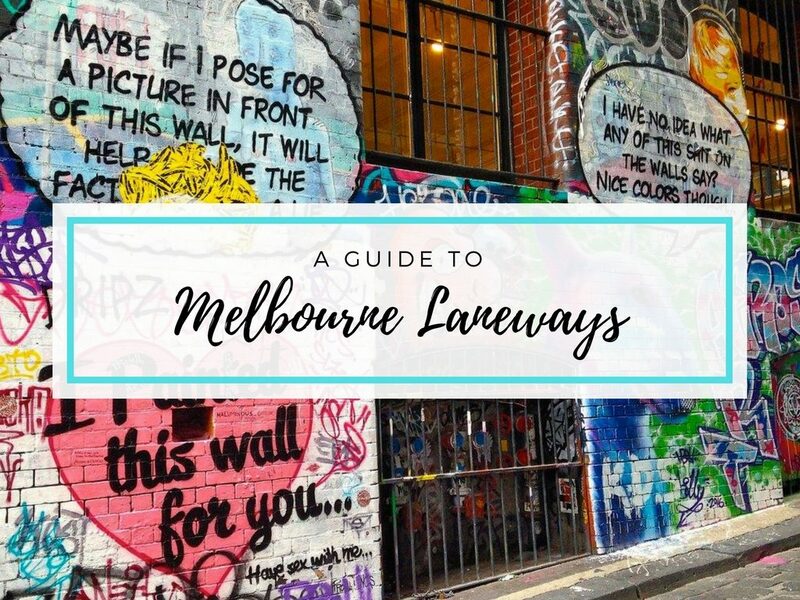 You’ll need to pay for this experience, but there are so many cool activities on offer that are worth it. While you can only view the tigers, there are so many ways to interact with the dolphins. 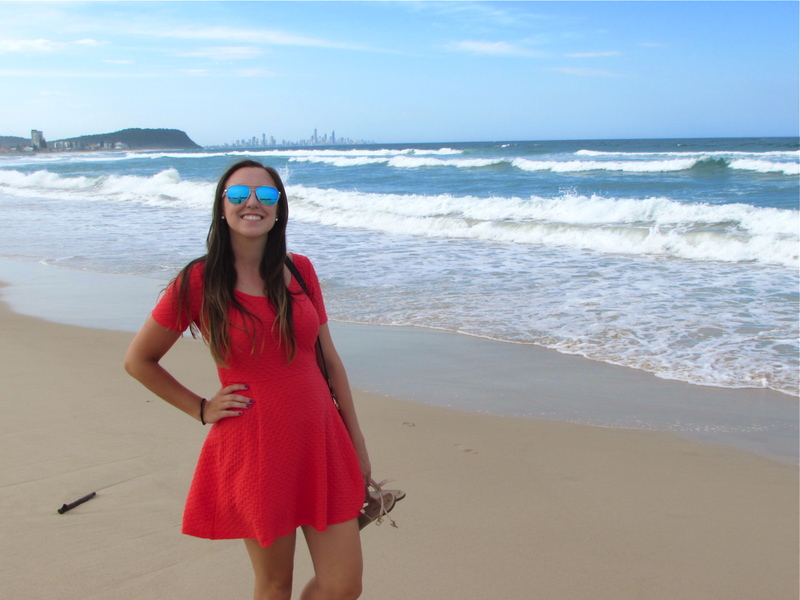 You can swim with the dolphins, paint with the dolphins, be a trainer for a day, or even do yoga with the dolphins! I have always loved dolphins so I know I would be in heaven in the Secret Garden! 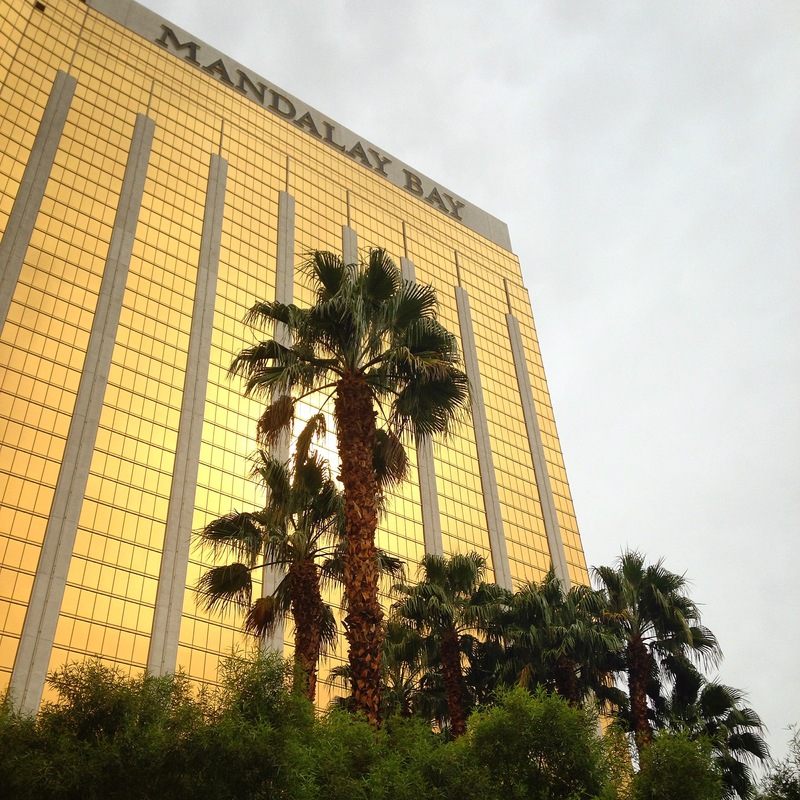 Probably one of the most beautiful hotel exteriors on the Strip is the golden Mandalay Bay. As soon as I arrived in Vegas, I heard from so many people that if I was looking to visit a nice pool, Mandalay Bay has the best one in the city. In the pool area, you’ll actually feel like you’re on a beach because the ground is all sand, and there is a wave pool that makes it seem like you’re on the ocean. There is even a lazy river which is perfect for families or anyone wanting to lay back and relax. And of course since this is Vegas, there is a swim-up bar and beachside casino! And of course you knew Vegas is full of nightclubs, but did you know it has some dayclubs too? The most popular one is the Moorea Beach Club at Mandalay Bay where there are regular pool parties with DJs and lots of glamourous people! Another really cool attraction is the Shark Reef Aquarium. In this aquarium, you can see all different types of sharks as well as jellyfish, sea turtles, piranha, and crocodiles. The biggest tank of the aquarium fully surrounds a walkway so you can get the best view of the animals possible. And if you’re really daring, they even offer an opportunity to dive with the sharks! It costs $650 for one person or $1000 for a pair, so it’s definitely pricey, but it is a one-of-a-kind experience. 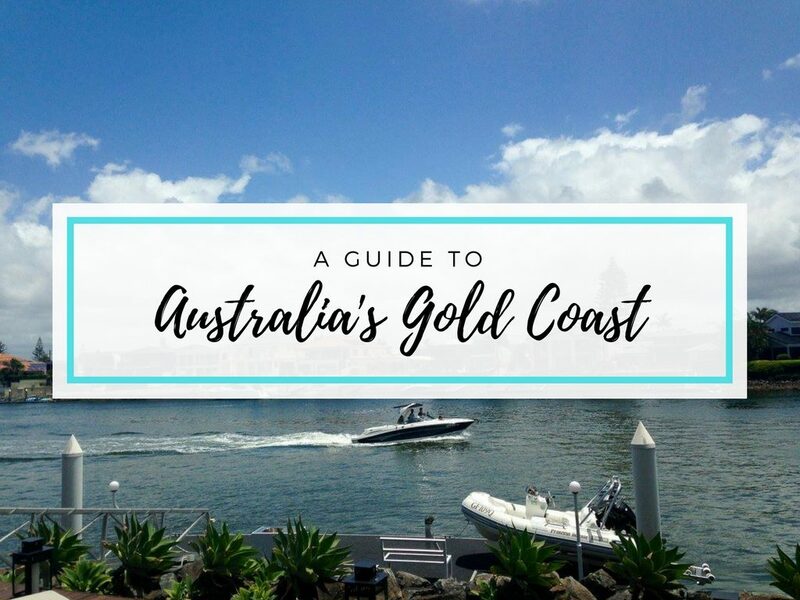 The whole experience lasts about four hours and you get the opportunity to dive with more than 30 sharks, so if you can afford it definitely go for it! Located pretty far down the Strip, Circus Circus isn’t too easily accessible from most of the other hotels (it took my sister and I a little over a half hour to walk there from the Venetian). 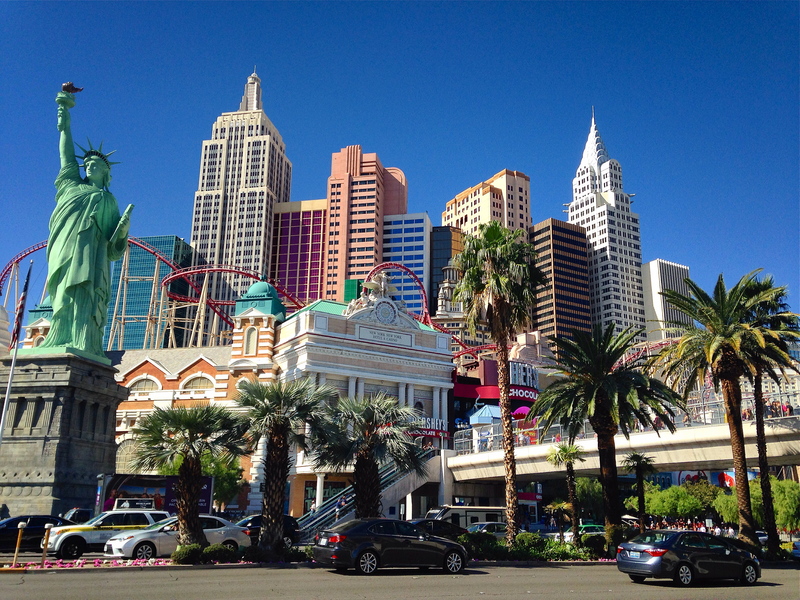 It is cool to experience though, so you should stray from the center of the Strip for a couple hours to check it out. As its name says, the hotel has a circus theme to it which you’ll see throughout. Definitely the coolest feature is that acrobats perform over the casino. If you head upstairs, there is a schedule of events and seating area where you can watch free acrobat performances. My sister and I watched a woman perform an impressive routine on long pieces of silk hanging from the ceiling, which was really cool. And if you like amusement parks, Circus Circus definitely has the most rides of any of the Vegas hotels. They have an area called Adventuredome where you can ride a bunch of roller coasters and thrill rides. You can pay an individual price if you just want to go on a couple rides, or you can purchase an all-day pass. 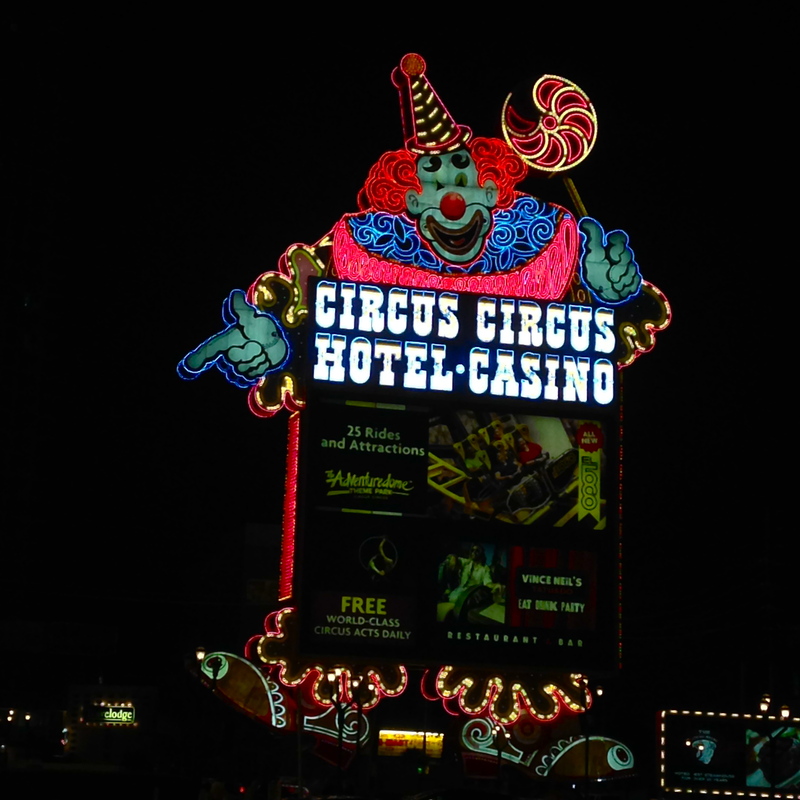 Circus Circus is definitely the most kid friendly hotel on the Strip, and has really low room rates if you are on a budget but want to stay on the Strip. Located way at the end of the Vegas Strip is the Stratosphere, the tall structure that looks like Seattle’s Space Needle. 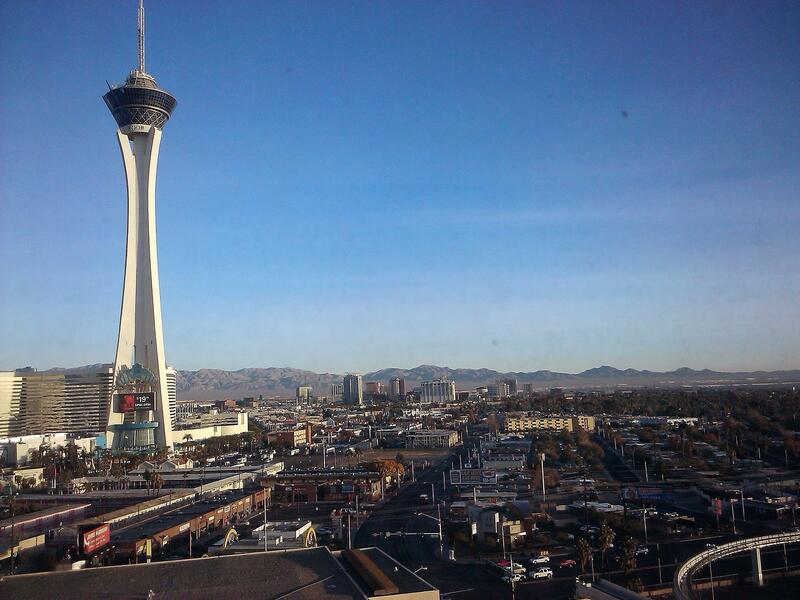 Since the Stratosphere is so far from the other hotels, I only had time to view it from afar, but it does have a lot of cool things on offer that are worth checking out. And even though it’s not central, the Strip monorail can quickly take you from the central part of the Strip to right near the Stratosphere. For what may be the best view of the Las Vegas Strip, head up to the observation deck on top of the tower. Also be sure to check out AirBar on top of the tower for an amazing view with amazing cocktails. They even have happy hour in early evening! And if you’re more daring, the Stratosphere has got you covered. There are rides where you hang off the edge of the tower, and another called the Big Shot where you are blasted up the length of the tower and then get the sensation of free falling back down. And the biggest thrill: the Sky Jump that lets you sky dive off the top of the tower! In addition to the hotels I mentioned above, there are lots more hotels and casinos lining the Strip. They can’t all be as amazing as the ones listed above, but there are some others that are definitely worth checking out. Caesar’s Palace doesn’t have many activities available, but it’s full of history and is so beautiful to walk around. It’s also the hotel where they stay in The Hangover so you may see an Alan impersonator walking around outside! Luxor is the Egyptian themed hotel. It is in the shape of a pyramid, and outside you can see a big pharaoh sculpture, lots of little statues, and a tall obelisk. Excalibur is next door and is designed like a castle from King Arthur’s time. The design inside is pretty cool, and you can see the occasional jousting tournament. MGM Grand is one of the most well-known hotels/casinos on the Strip and is the third largest hotel in the world. It’s beautifully designed inside, and you can see a huge golden lion out front. Also, be warned—people always mention that there are lions available to view at the MGM Grand, but when I asked someone who worked there, they said the lions were only a short-term attraction that ended four years ago! The Wynn is a luxury hotel that is one of the newest on the Strip. Right outside the hotel you can see a beautiful waterfall, and if you can afford some luxury the hotel has restaurants and a spa with five star ratings. 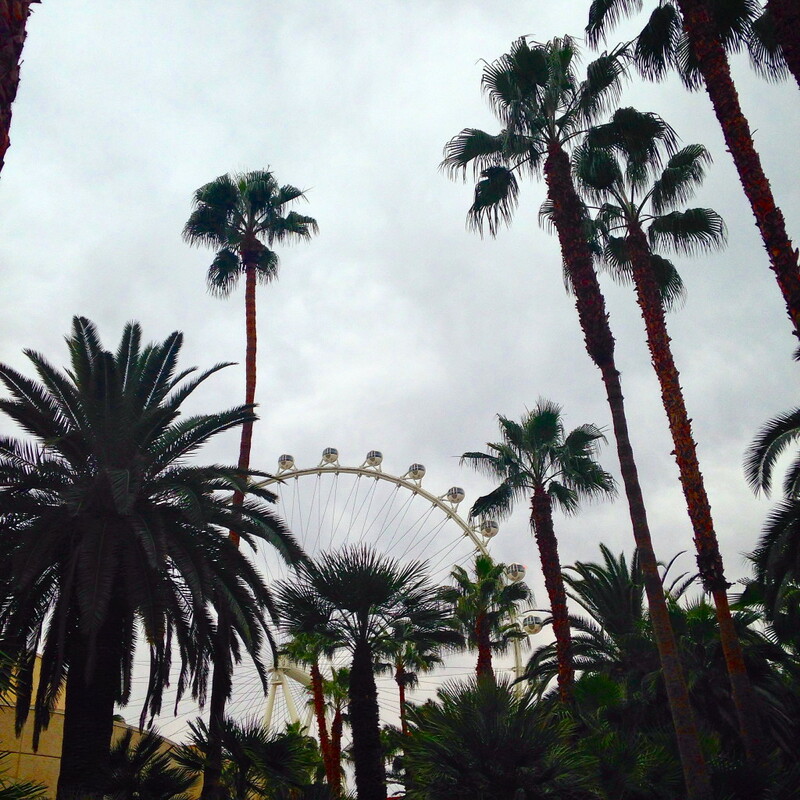 The Linq has a great outdoor promenade lined with shops, restaurants, and bars as well as something called the High Roller—the world’s tallest observation wheel. And finally Tropicana has been rated the “best in Las Vegas” several times. It’s also where you’ll find the famous Laugh Factory comedy club where you can see hilarious shows! 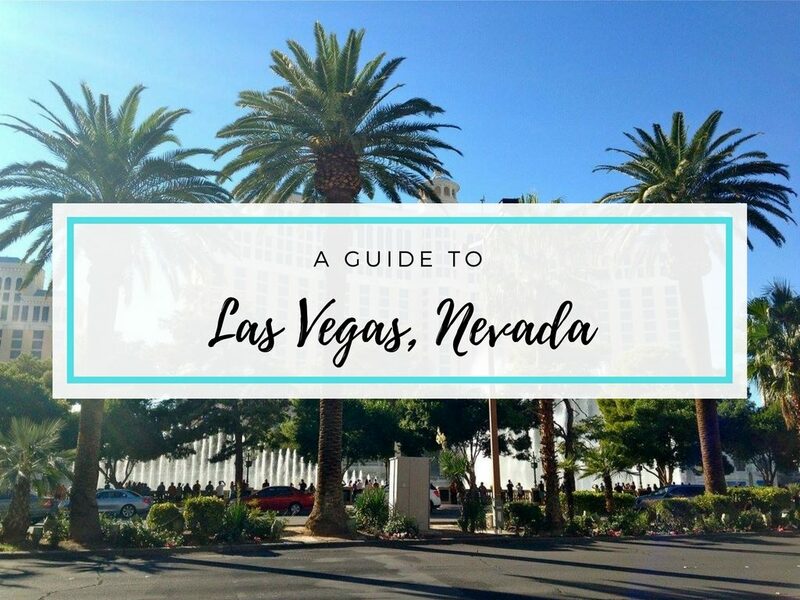 And there you have it, my ultimate guide to the hotels and casinos on the Las Vegas Strip! Some people go to Vegas and spend most of their time in their own hotel, but I think the only true way to experience the Vegas Strip is by walking around and checking out as many of the hotels and casinos as you can! They all offer something unique and exciting, and I can’t wait until my next visit to Las Vegas when I can try to experience even more that all the hotels have to offer! Now over to you! 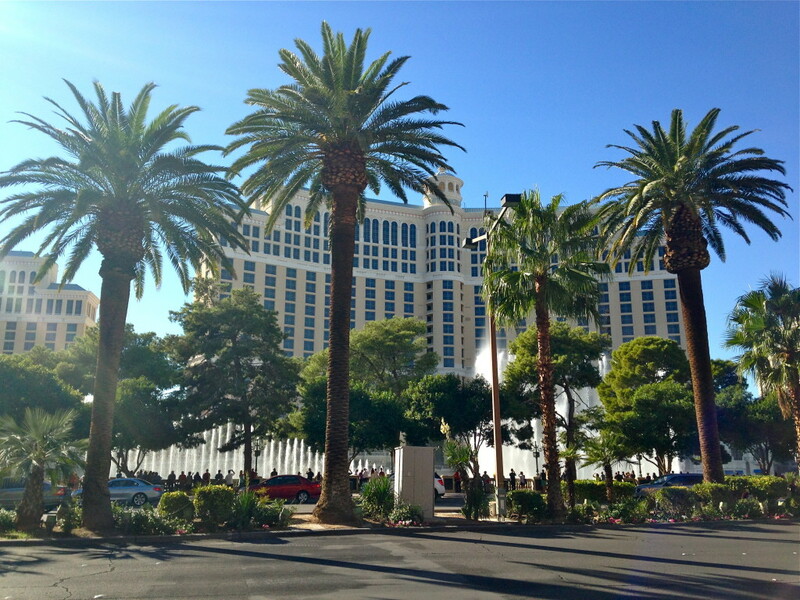 If you’ve been to Las Vegas, what were your favourite hotels and activities on the Strip? Is there anything really cool that I missed? And if you haven’t been to Vegas yet, what would you be most excited to see there? Let me know in the comment section below! Thank you, Christie! 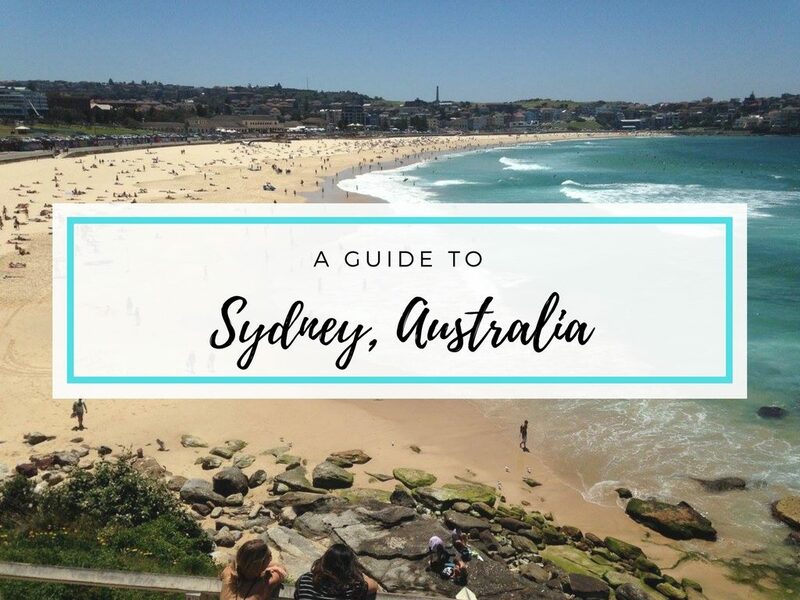 Although I’ve visited twice, this is immensely helpful as a quick hit guide to the best and brightest spots. I will def use alot of your suggestions when I take my daughter next weekend for her 21st!